White paper on Customer / Product Costing and Profitability Analysis NEW! Research article on Predicting the Path of Technological innovation. Forget Moore’s law, there is now a better model. More advanced Excel tools, as well as access to training services, required registration. Financial Ratio Analysis: this simple template shows how the 4 categories of financial ratios and KPIs are calculated (Profitability, Liquidity, Stability and Capital efficiency ratios), and how each ratio addresses a specific question. S-curve models for forecasting demand and the adoption of innovation: this template includes 5 models: the logistic (Fisher Pry), Bass, Gompertz, Weblus (modified logistic) and exponential models. It also includes tips to help you choose the right model for your work. Business Planning for ICT: this comprehensive template has been used extensively by Investaura in the preparation of business plans for its clients, including in an M&A context. Solution business case for solution suppliers and service providers: this beautiful template captures a single solution (or business line) and will be useful for service providers planning to launch a new service, or suppliers needing a business case tool for sales support purposes. Business Plan and Valuation template for Telecoms operators: this detailed template is specifically for telecoms service providers; it has been used by Investaura on many assignment for telcos worlwide. It is detailed enough to capture all the salient features of a telco, without getting lost in details that are irrelevant in a long-term planning context. Budgeting and Planning template for telcos: this is a very detailed template that combines both (short-term) Budgeting with (mid-term) Business Planning. So you can capture both the details of the next 12 months, and what the plan is in the following 3-5 years. Financial Results template: this template can be linked to your main business plan. It provides full financial statements forecasts, including on the Balance Sheet side (working capital, debt and equity requirements). You can use it to summarise the key results and share your financial business plan with others. So which Business Plan template is the right one for you? If you are preparing a business plan for the first time, and if your needs are fairly simple, then the Business Planning for beginners is a good choice. If you are a service provider and need to prepare a business plan for a new service (line) or solution, or if you are a supplier looking for a business case for sales support, then the Solution business case for suppliers and service providers is the right template for you. The advanced version includes scenario management functionality, as well as a sensitivity analysis module. If you need a full Profit and Loss (P&L), Balance Sheet (B/S) as well as Cashflow statement, and want to forecast revenues both by product line and geography, then the Business Planning for ICT is a great template to get started. Even if your business in not in ICT, you can easily modify the template to your particular industry. If you are a telecoms service provider, then you will appreciate the Business Plan and Valuation template for Telecoms operators. It captures the business of a telecom mobile network operator and includes a 15 year planning horizon, a sensitivity analysis and a Valuation module. If you are a telco or a service provider and also need to capture the short-term future in a lot of detail, for example because you need to combine Budgeting and Planning in the same tool, then you should use the Budgeting and Planning template. 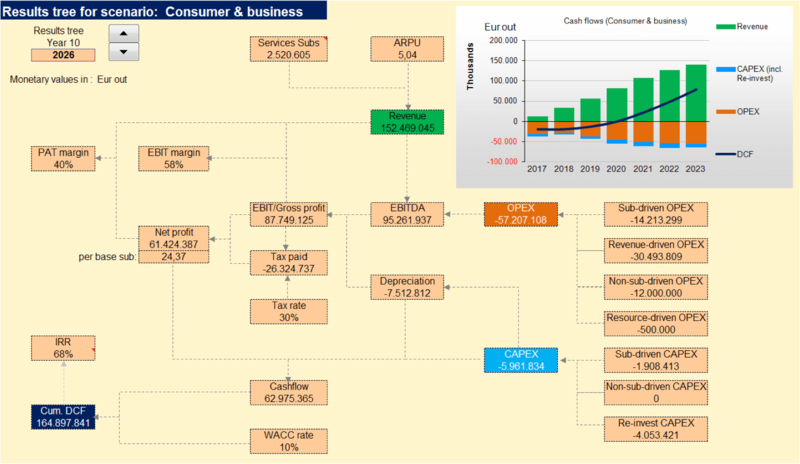 Finally, if you need a generic but powerful financial statements template and forecast (P&L, Cashflow, Balance Sheet) that doesn’t require 1000s of input and can easily be presented and shared with others, then the Financial Results template is an excellent starting point. And if you are neither in the ICT industry, nor a service provider, then you can still easily modify the templates above to adapt them to your own business! Combine the various templates to create your own business plan! The Excel templates and business plans provided above can all be used in a standalone manner. But they can also be used as building blocks and combined: the elements that you find particularly useful in one template can be copied and used in another template. say that you have a business plan with Profit and Loss and Cashflow statements, but now need a Balance sheet forecast and model for how the business will be funded (debt, equity) in the next 5-10 years. Then you can use the generic Financial Results template and its funding model to add a Balance Sheet to your existing business plan. there is a beautiful and powerful Results Tree (see previous picture) in the Solution business case for suppliers and service providers that can greatly facilitate the presentation of results. If you like it, then take a copy and put it into your own business plans!